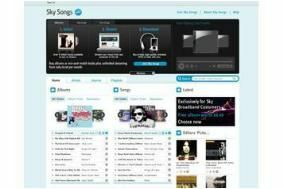 BSkyB closes its Sky Songs music service after just a year | What Hi-Fi? The music streaming service was "unable to reach a large customer base", the company admitted. Sky Songs offered a premium service of ad-free streaming of up to four million songs for £6.49 or £7.99 a month, although the price had been steadily reduced since its launch in October 2009. At the time Sky had signed deals with EMI, Sony Music Entertainment and Warner Music, as well as a number of independent record labels and producers. In an email to customers yesterday, Sky said that although it was a "really innovative and good-value digital music service", Sky Songs has failed to reach a "large enough" customer base. Existing customers will have their payments cancelled immediately, but they will still be able to access the service until its full closure on 7 February. Any downloaded music is owned by the customer and unaffected by the move. A Sky spokesman said the decision had been "difficult", adding that the company "just didn't see the consumer demand" it had hoped for.